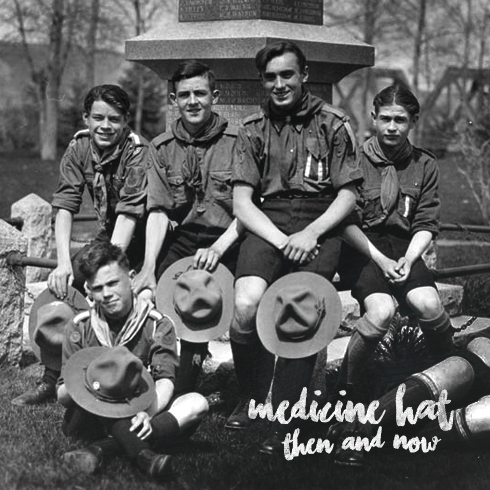 A continuation of my "Then & Now" photo series of Medicine Hat, Alberta featuring archival and modern day images in side by side comparisons. The original school is seen here in 1950. 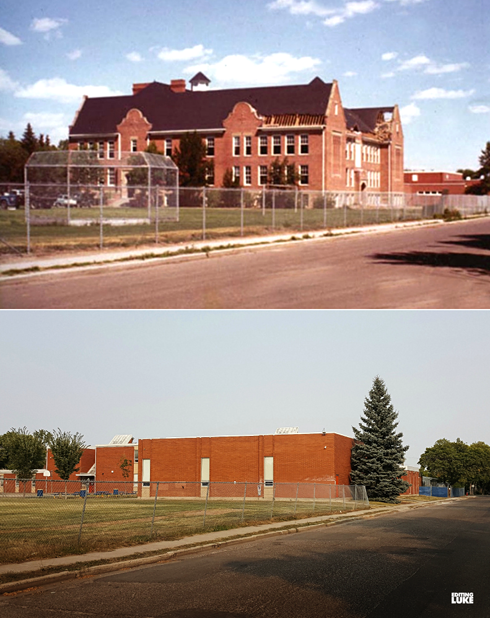 It was later demolished in 1970 following a fire and Alexandra was expanded to how it looks now. The original sandstone block that used to sit above the door of the old building can still be seen out front of the school today. 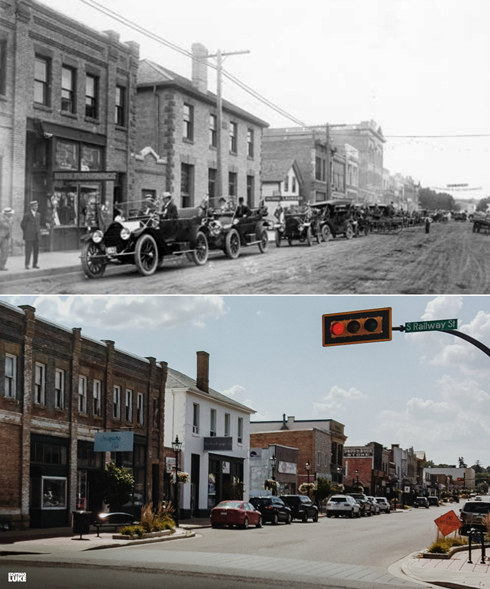 New cars line 2nd Street after arriving in Medicine Hat, Alberta in 1912. A lot of the historic buildings can still be seen here in 2017. 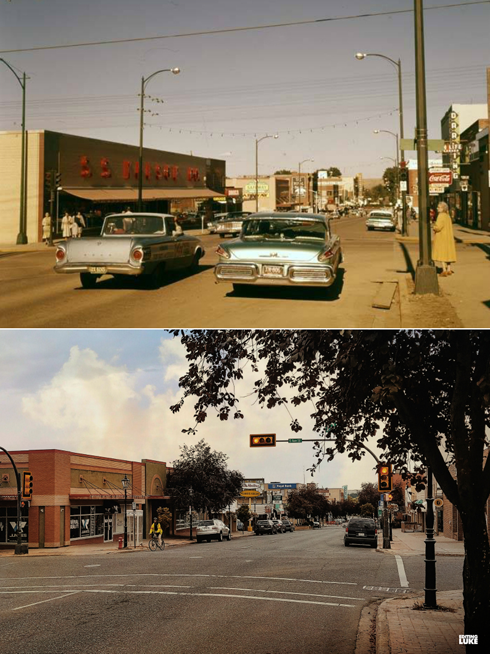 Here we see 3rd Street in the 1960s and in 2017. I heard Kresge's was kind of a big deal back in the day. And how about those cars? 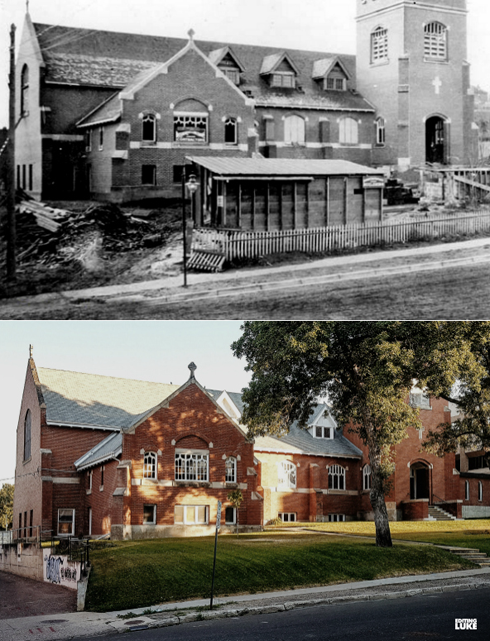 Here we see the construction of St. Barnabas in 1912 contrasted against the same view in 2017. This church is still looking great a century on. 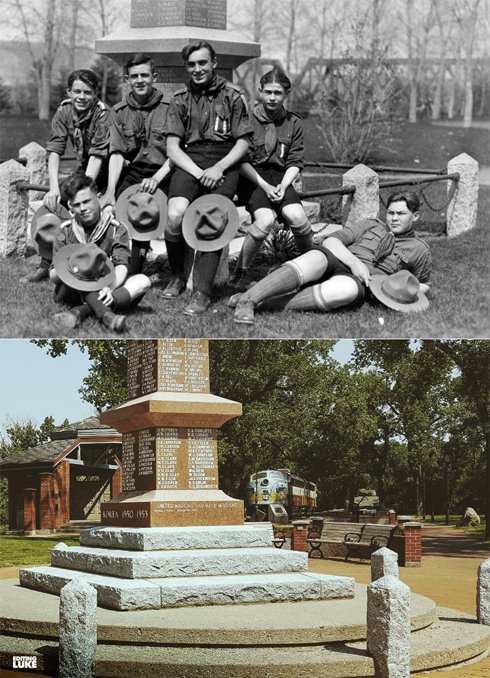 Boy scouts sit around the cenotaph in Riverside Park in 1929. The 2017 image shows just how much the park has been developed over the decades with pathways, a band stand, monuments, landscaping, etc. More profoundly, it's worth noting that more names have also been added to the cenotaph following WWII, Korea, and Afghanistan. What immediately came to mind after seeing the archival image was that these boys would have been prime fighting age when WWII broke out 10 years after this was taken. South Railway Street has come a long way since people were parking their horse and buggy here in 1912. The Hargrave Block (now Inspire Cafe) is a notable landmark. 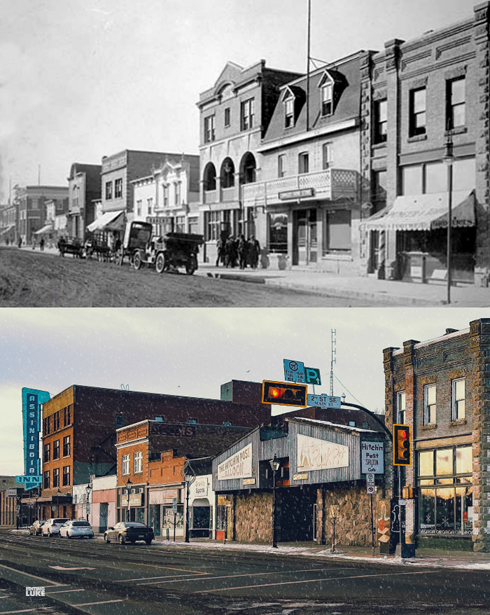 Also, the Hooper-Huckvale Block (which would go on to become the Assiniboia Hotel in the 1950s) was built the year after this picture was taken in 1913. 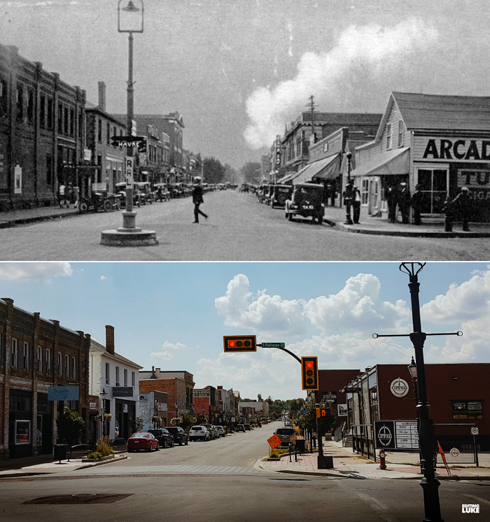 Cars along 2nd Street in the 1910s contrasted against cars on 2nd Street in 2017. The old Alexandra is seen here in the early stages of demolition in 1970 (following a fire / water damage). 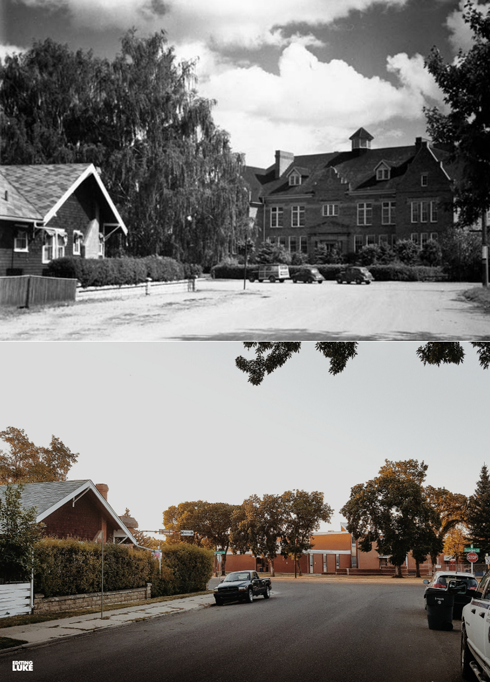 Contrasted with the same view of the school in 2017, it's easy to see what a remarkable structure it was. 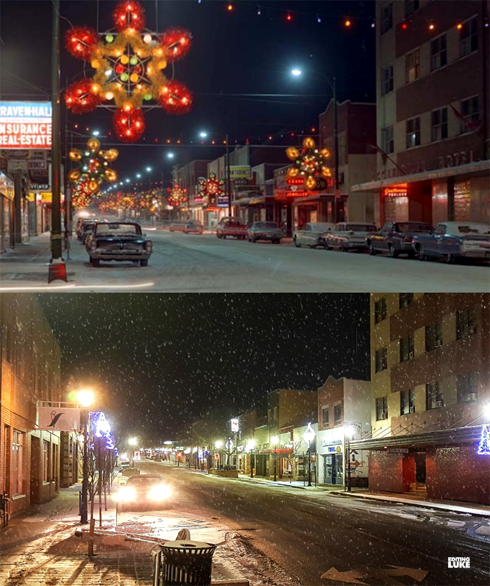 Christmas decorations on 3rd Street in December 1968 meet a much more subdued 3rd Street in December 2017.